Erdogan travels to Paris on Friday for talks with French President Emmanuel Macron while Foreign Minister Mevlut Cavusoglu will be heading to the hometown of his German counterpart, Sigmar Gabriel, on Saturday in a bid to patch up ties. Ties between Ankara and some European nations were already at a low over Turkey’s stalled EU membership negotiations. Tempers flared after authorities in several countries last year prevented Turkish government ministers from holding political rallies to court expatriates’ votes in a referendum on giving Erdogan expanded powers. Erdogan unleashed a series of insults at his allies, accusing European officials of racism, harboring terrorists and behaving like Nazis. European nations, meanwhile, are alarmed by the deteriorating state of human rights and democratic institutions in Turkey, in the wake of the 2016 failed military coup. Around 50,000 people have been arrested since then and 110,000 others removed from public sector jobs. Turkey in turn accuses EU nations of not supporting it in its struggle against the movement led by U.S.-based Muslim cleric Fethullah Gulen, whom it blames for the coup. Gulen denies involvement in the attempt. “Even if they hate each other (Turkey and European nations) are aware that they are obliged to cooperate on so many issues,” said Semih Idiz, a Turkish foreign policy analyst who writes for al-Monitor website. He added, however, that bridging ties would be no easy task. Germany is particularly irritated by Turkey’s jailing of several German or German-Turkish nationals, including a prominent journalist, on terror-related charges, and even issued a travel warning for German citizens planning to visit Turkey. Berlin reacted with caution to Erdogan’s comments on improving relations with Europe, stressing the importance of the situation of the arrested German citizens. Erdogan is sounding upbeat about improved ties. In comments published in Turkey’s Hurriyet newspaper last month, Erdogan described the leaders of Germany, the Netherlands and Belgium as “old friends,” called recent contacts with them “quite good” and noted that they, like Turkey, oppose a controversial U.S. decision to recognize Jerusalem as Israel’s capital. “They have not left us alone on (the Jerusalem) issue,” Erdogan said. 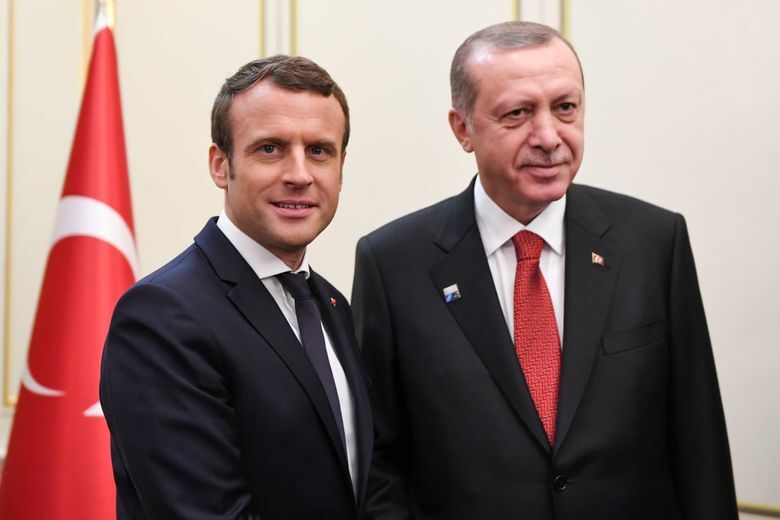 In Paris, Erdogan and Macron are to discuss Turkish-EU ties as well as the Palestinian issue and the conflict in Syria and Iraq, said Erdogan’s spokesman, Ibrahim Kalin. 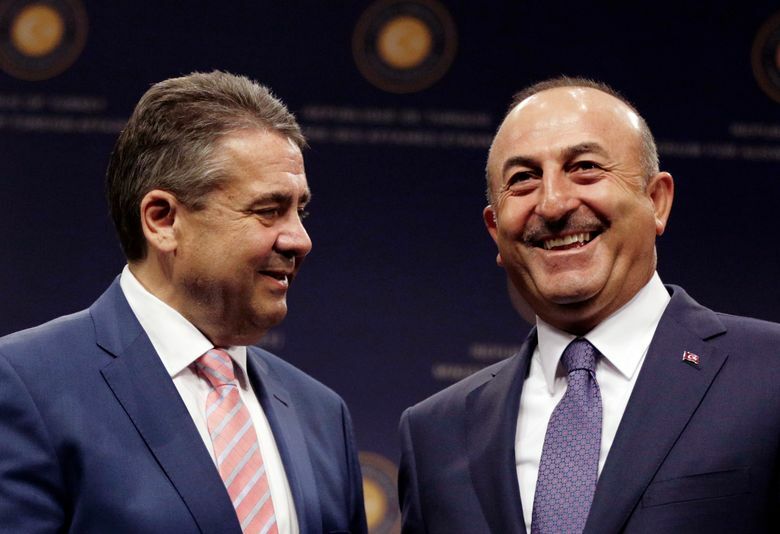 The following day, Cavusoglu will meet with Gabriel in the central German town of Goslar. Details of the meeting have not been disclosed, but Cavusoglu has said it is part of Turkish efforts to mend ties. Late last year, the two ministers met in Cavusoglu’s hometown — the Mediterranean resort of Antalya. Turkey’s desire for improved relations with Europe also comes at a time when its ties with the United States have soured over a slew of issues, including Jerusalem, Washington’s continued support for Kurdish fighters in Syria and the trial of a Turkish banker accused of helping Iran evade U.S. sanctions.